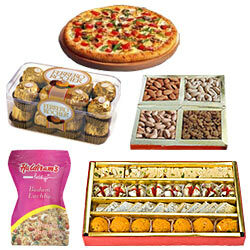 Deliver happiness by gifting this Romantic Forever Food Combo to your relatives and friends. This Food combo is comprised of 100gms Assorted Dry Fruits, 250gms Haldiram Assorted Sweets, 200gms Haldiram Badam Lachha, 16Pcs Ferrero Rocher Chocolates and Rs. 400 Pizza Hut Gift Vouchers.